The Chairman of the defunct National Electoral Commission, Prof. Humphrey Nwosu, has announced that he will not be able to attend the posthumous investiture of the presumed winner of the June 12, 1993 presidential election, the late Chief Moshood Kashimawo Abiola, as the Grand Commander of the Federal Republic scheduled for Tuesday (today). The Federal Government had invited Nwosu and key stakeholders in the struggle for the revalidation of the election to the event during which the late human rights activist, Chief Gani Fawehinmi, will also be honoured posthumously with the Grand Commander of the Order of Niger alongside Abiola’s running mate, Babagana Kingibe. 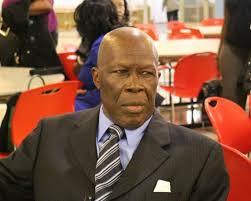 But Nwosu regretted that he would not be able to attend the event because he was outside the country. He however commended President Muhammadu Buhari for recognising June 12 as the country’s Democracy Day and for honouring Abiola. He said the honour would rekindle the national consciousness of all Nigerians for a better nation. Nwosu’s position was contained in a letter addressed to the Secretary to the Government of the Federation, Boss Mustapha. Copies of the letter dated June 10, 2018 were made available to journalists in Abuja on Monday by the SGF’s spokesman, Lawrence Ojabo. Nwosu said June 12, 1993 marked a turning point in Nigeria’s tortuous journey towards a democratic polity. The letter read, “I thank His Excellency, the President of the Federal Republic of Nigeria, Muhammadu Buhari and the Federal Government of Nigeria for recognising June 12 as Democracy Day and also honouring the winner of June 12, 1993 presidential election, Chief MKO Abiola. “Undoubtedly, the democratic system of governance is the best especially for a multi-ethnic nation like ours. I thank you for building on the foundation which my team and I laboured strenuously to establish and actualise on June 12, 1993. “It is our hope that expanding the frontiers of democracy of which all the people of Nigeria, regardless of ethnic group, will provide economic, social and developmental benefits that will certainly make Nigeria a great nation not only in Africa but across the world. “Certainly, the scheduled event on Tuesday, June 12, 2018 will rekindle the national consciousness of all Nigerians for a better nation. Meanwhile, a former Vice-President and presidential aspirant on the platform of the Peoples Democratic Party, Atiku Abubakar, has warned against what he called a consistent pattern of departure from constitutional due process to tendencies of authoritarianism. The former Vice-President said in a statement to mark the 25th anniversary of the June 12, 1993 presidential election, that there was a growing culture of arbitrariness in some of the institutions of government at all levels that were contradictory to the notion of inclusiveness and fairness that a democratic society guarantees. Atiku said that democracy was not merely a mechanism of appointing a government; but that its beauty was in the inherent safeguard to the citizenry to live and prosper as free people under the law. But the Peoples Democratic Party has accused the Presidency of politicising the posthumous national award given to Abiola. The party also accused President Buhari of midwifing the circumstances that led to Abiola’s travails. The PDP alleged that Buhari overtly betrayed his political inclination in the article published by the Presidency, which it claimed, relegated the virtues of Abiola and dwelt on praise-singing of the President. The party, in a statement by its National Publicity Secretary, Mr. Kola Ologbondiyan, in Abuja on Monday, noted that the Presidency, in the article, relied on false performance indices and insinuations, ostensibly aimed to set up perceived political opponents of the current administration as Abiola’s traducers. Ologbondiyan said, “This publication also confirmed fears that President Buhari desperately seeks to use Abiola’s revered name and person to draw political capital ahead of the 2019 general election. “The Presidency in its desperation went ahead to demean the exalted office of the President, as well as the import of the posthumous award, by sponsoring tweets to divert public attention from Chief Abiola and his virtues, to procure praises for President Buhari. “If there is any person to blame for Chief Abiola’s travails, should it not be President Buhari who, on December 31, 1983, staged a military coup that destroyed democratic governance, locked up politicians without trial and set the stage for the deferment of democratic governance, which Chief Abiola paid the supreme sacrifice to restore? However, the people of Gbagura in Abeokuta, the capital of Ogun State, who are the kinsmen of the late Abiola, have commended Buhari for bestowing the GCFR honour posthumously on MKO. They gave this commendation during a media briefing held at the palace of Agura of Gbagura, Oba Halidu Olaloko, on Monday. The Agura of Gbagura, who was represented by Balogun of Ojoo-Gbagura, Adio Baiyewun, however, appealed to the President and the National Assembly to go a step further by making June 12 the handing over date to every new government. Oba Olaloko said, “We appreciate President Buhari for bestowing the posthumous award of the Grand Commander of the Federal Republic on the late Chief MKO Abiola. “We equally applaud the National Assembly led by the Senate for directing the Independent National Electoral Commission to formally declare Chief MKO Abiola winner and as an ex-President of the Federal Republic of Nigeria with all his entitlements fully paid. But a member of the Gbagura Council of Chiefs, Bode Mustangs, advised President Buhari to send an Executive Bill to the National Assembly with the view to giving constitutional backing to the President’s declaration. Some chieftains of the defunct Social Democratic Party in the Third Republic who shared their experiences on the annulment of June 12, 1993 presidential election on Monday trade blame over their alleged involvement in the annulment of the election widely believed to have been won by Abiola. A former General Secretary of the Nigeria Union of Petroleum and Natural Gas Workers, Chief Frank Kokori, in an interview with one of our correspondents, said members of the defunct SDP betrayed Abiola. A presidential aide, Garba Sheu, had on Sunday said the nation’s elite conspired to annul the presidential election. Kokori said the position of the presidential aide was spot on, adding that even some members of the SDP betrayed the cause. He said, “Even in my SDP, there were fifth columnists. It was obvious. The military were also part of it at the time. Abiola was the richest black African at the time. He had so much wealth and when you have that with power, people would be afraid of you. Kokori, who was part of the SDP executive leadership, said the leaders of the SDP including the National Secretary of the party, Sule Lamido, who later became the governor of Jigawa State, betrayed Abiola. But Lamido denied allegations levelled against him by Kokori over the June 12 saga. Lamido was reacting to an allegation that he abandoned the June 12 struggle. The former governor, in a text message to one of our correspondents, said as of the time of the events leading up to the annulment of the June 12, 1993 election, Kokori was not in a position to know what occurred. Lamido said, “Kokori was a member of the first (SDP) executive under Babagana by which time I was the Kano State chairman. He promised to speak up “very soon” about what transpired at the time. On its part, the Director-General of the MKO Abiola campaign organisation, Senator Jonathan Zwingina, on Monday, said the SDP members who served in the Gen. Sani Abacha government all had the permission of Abiola. However, a former personal assistant to the late Abiola, Lisa Olu Akerele, has appealed to President Buhari to give financial compensation to the late politician’s family for the loss and pains they suffered as a result of the June 12 saga. Referring specifically to MKO’s crumbled business empire including the Concord Press of Nigeria, Radio Communication Nigeria Limited, Abiola Bookshops, Abiola Bakeries, Abiola Farms, Concord Airlines and Summit Oils, Akerele said the compensation would help the family to revive the companies. While commending Buhari for granting posthumous honour to Abiola, Akerele noted that those who suffered incarceration and other economic losses should be compensated to ameliorate the pains they suffered in the wake of the 1993 political crisis which followed the annulment of the June 12 presidential election. The veteran journalist, who was also incarcerated for two years by Abacha, commended Asiwaju Bolaji Tinubu, for sustaining the campaign for Abiola’s posthumous award. He recalled that on March 1, 2016 he and the late Abiola first son, Kola, met with Tinubu in Lagos where they brainstormed on the issue. Akerele blamed the military dictator, Ibrahim Babangida, for truncating the June 12 dream, adding that this would haunt IBB through the rest of his life. Akerele decried the role played by former President Olusegun Obasanjo “who declined to right the wrong perpetrated by an evil genius,” adding that the former President ignored persistent calls by right thinking individuals in the society to correct the evil Babangida planted. He praised Buhari for “coming to judgment at the nick of time,” noting that posterity would place his name in the right sphere of Nigeria’s history. Akerele cautioned those he described as agents provocateur in the National Assembly to allow democracy take firm root in the nation’s body polity. Meanwhile, a chieftain of the Peoples Democratic Party in Adamawa State, Dr. Umar Ardo, has asked the Federal High Court in Abuja to stop the conferment of posthumous national honours on Abiola and Fawehinmi. Ardo, a former Special Assistant to then Vice-President Atiku Abubakar, on Research and Strategy, also asked the court to stop the investiture of such national honour on Abiola’s running mate in the 1993 presidential election, Kingibe. The PDP chief on Tuesday filed the suit marked, FHC/ABJ/CS/609/2018, contending that “without the advice of the Council of State” the President lacked the power to confer the national honours as planned. He also asked the court to set aside the decision of President Buhari to confer national awards on the planned honourees. Ardo joined the President, the Secretary to the Government of the Federation, Mr. Boss Mustapha, and the Attorney General of the Federation, Mr. Abubakar Malami (SAN), as the defendants. He filed along with the main suit a motion seeking “an interlocutory injunction” restraining President Buhari and other defendants from going ahead with the conferment of the national honours as planned for Tuesday. He also wrote to the SGF through his lawyer, Mr. Doueyi Fiderikumo, shortly after filing the suit on Monday, warning that the conferment ceremony be stayed in the light of the legal action. The lawyer wrote, “In this development, you are advised to stay action on the conferment of the said award on the late Chief M.K.O Abiola, Ambassador Babagana Kingibe, and the late Chief Gani Fawehinmi, so as not to interfere with the subject of the said case. “An advance copy of the said suit is hereby attached for the avoidance of doubt,” he added. But Ardo in his suit filed on Monday argued that the national honours could not be conferred since the President had yet to obtain the advice of the Council of State in that respect. He argued that the conferment of the national honours planned to hold on Tuesday (today) would violate section 5(1)(b) and section 6(a)(iii) of Part 1 to the Third Schedule of the Nigerian Constitution. He therefore urged the court to make, “A declaration that the 1st defendant (Buhari) lacks the constitutional powers to award National Honours to the late Chief M.K.O. Abiola, Ambassador Babagana Kingibe, the late Chief Gani Fawehinmi or anybody else for that matter without the advice of the Council of State as provided for in section 6(a)(iii) of Part 1 to the Third Schedule of the Constitution of the Federal Republic of Nigeria 1999 (as amended). “A declaration that the decision of the 1st defendant to award National Honours to the late Chief M.K.O. Abiola, Ambassador Babagana Kingibe, late Chief Gani Fawehinmi or anybody else for that matter without seeking and obtaining the advice of the Council of State is contrary to sections 5(1)(b) of the Constitution of the Federal Republic of Nigeria 1999 (as amended) and section 6(a)(iii) of Part 1 to the Third Schedule thereto and is thus null and void.